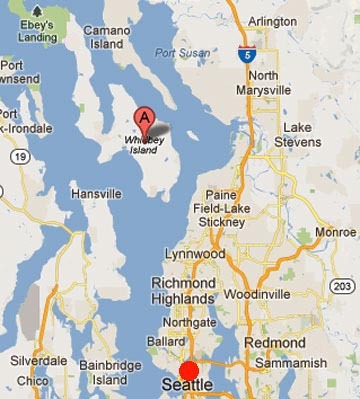 Whidbey Island is about 30 miles (48 km) north of Seattle in Puget Sound. 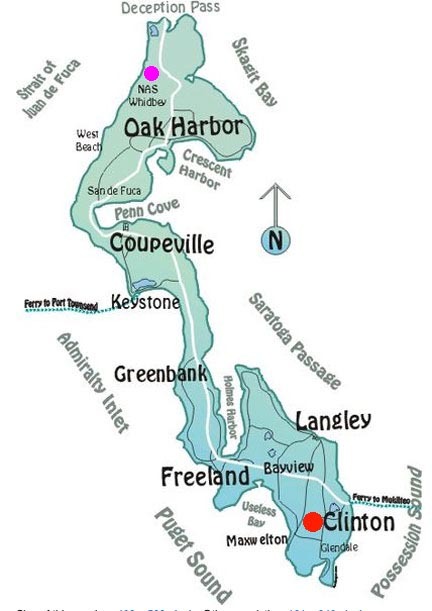 Clinton, population 928, is located on the southern tip of Whidbey Island in Island County, Washington (red circle). Much of the village and surrounding farms are situated on a high bluff overlooking Saratoga Passage on Puget Sound. The Naval Air Station is at the northern end of Whidbey Island (pink circle). March 15, 2013 Clinton, Whidbey Island, Washington - A mare named Lady was found in September 1967, near Alamosa, Colorado, with all her neck and head flesh and hide stripped away to bone. All her chest organs were “surgically removed” according to John Altshuler, M. D., Pathologist and Hematologist, who visited the site and told me about his findings for my first book, An Alien Harvest © 1989. See Earthfiles Shop. Around the world in both hemispheres, thousands of cows, horses, sheep and other domestic and wild animals have been found with oval or circular-shaped excisions without blood and no signs of struggle around the dead and mutilated bodies.